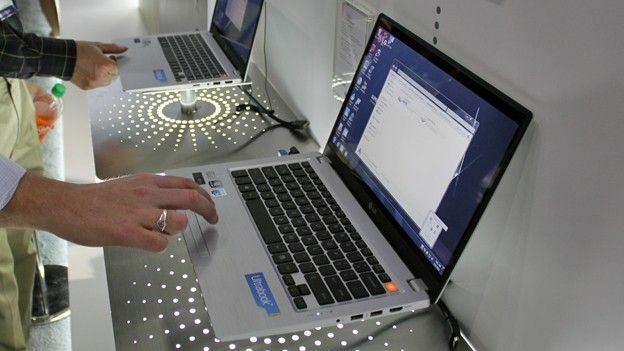 We've seen our share of Ultrabooks already, and it is likely that we'll see up to about 50 new models being launched or displayed here at CES. In a crowd like that, it's hard to stand out, but LG still managed to grab our attention with the LG Z330 and LG Z430, which the company has dubbed “Super Ultrabooks”—you know, because they're better than the rest. We spent some quality time with the larger Z430 model. The Z430 sports a 14-inch screen, but because of a 4.5-millimetre thin bezel, the laptop actually feels much closer to a typical 13-inch laptop. Unfortunately, you only get 1366 x 768-pixels of virtual desktop real estate, though, in our opinion, a 14-inch screen should offer at least 1680 x 1050 pixels. In comparison, the 13-inch Apple MacBook Air gives you 1440 x 900 pixels with which you can play. As we've come to expect from most Ultrabooks, the design takes heavy cues from Apple's MacBook Air, but the Z430 does have its own distinct identity, and it's hard not to fall in love with the brushed metal frame and the unit's clean lines and minimalistic design. The touchpad almost looks like it's one with the chassis, and the backlit keyboard felt comfortable to write on during our limited encounter with it. Weighing in at 1.5 kg with a 19.9 mm chassis, this model's a tad thicker and heaver than most Ultrabooks, but that's because you're rewarded with an extra HDD alongside the system's SSD that works as the primary drive for Windows and your programs. LG will offer the Z430 with up to 500GB of extra storage, allowing you to use the HDD for music, photos, and videos without worrying about running out of that costly SDD space. It looks like there will be SSD options ranging from 16 GB to 256 GB, but you'd have a hard time squeezing anything but Windows into a mere 16GB of space. The laptop accommodates a full range of ports, so you don't have to worry about carrying around multiple adapters. You get a full-size 10/100 Ethernet port, 1x USB 3.0 port, and 2x USB 2.0 ports along with HDMI out and a 4-in-1 card reader, which for some reason sits on the back of the machine. We're thinking, though, that it might become a bit annoying to have to reach around the laptop and fumble about each and every time you want to transfer pictures from an SD card. On the wireless side, you get Wi-Fi 802.11 b/g/n and Bluetooth 3.0+HS. Final models will be powered by either a 1.6 GHz Core i5-2467M or a 1.7 GHz Core i7-2637M processor, giving you plenty of oomph for those everyday tasks. Unlike most other ultrabooks, the Z430 supports up to 8GB of memory, which should be more than enough to get Windows 7 and all your programs to run smoothly. The built-in Intel HD 3000 graphics chip will not run the latest batch of 3D games, but if that is at all important to you, you shouldn't even consider purchasing an Ultrabook in the first place. Booting time is approximately 12 seconds, a tad longer than that of most competitors, but that's apparently because the extra HDD needs to initialize at boot up. After waking up from standby mode, the Z430 was ready to use in fewer than two seconds, and overall, the laptop felt zippy and eager to execute our every command. LG says the Z430 will offer more than six hours of battery life, which is not fantastic but still very decent, and should allow you to head out the door without the charger and not worry too much about running out of juice. Obviously, we didn't have the chance to test the battery life during our preview, but we'll investigate further in our final review. The Z430 looks like an interesting ultrabook for those in search for a machine that's able to offer more storage space, more memory, and a larger screen while still retaining a slim design and low weight. You get a fast SSD for Windows and programs and a comfortably large HDD for all your personal files, and eight gigs of memory will help keep everything running smoothly even when joggling many apps at the same time. Oh, and the design, materials, and build quality really are spot on.